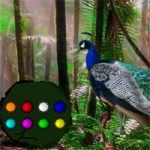 WOW Peacock Dance Forest Escape is another point & click escape game developed by WOWEscape. In this game, you are trapped inside a forest full of dancing peacocks. Your aim is now to escape from this place by finding useful items and by discovering hints to solve puzzles. Click on the objects to interact with and solve all puzzles you will encounter on your way. Good luck and have fun! Thanks for the game, WOW! Try putting the bird into a dark hole in a tree somewhere. Check lower right in scene with orange 6 for a sneaky object. Check rock on left in first scene of 3rd set for a clue. Thanks for the bird clue - after that it was easy! well I need more help. Where is the hole for the bird? I am stuck in the first scenes. with just bird and an orange plant or fruit of some kind.